Welcome to my busy life…I’m usually up at 5AM and away from home until 5PM. So when people tell me, ‘I don’t have time to eat healthy! I don’t have time to cook!‘ I completely get it. There’s too much going on in our daily lives nowadays (it’s awesome! But it’s also one of the worst things for our bodies). Anyways, making dinner, especially a healthy dinner is often out of the question. But if you’re looking for something simple, quick, and easily thrown together with ingredients you probably have around the house, look no further! 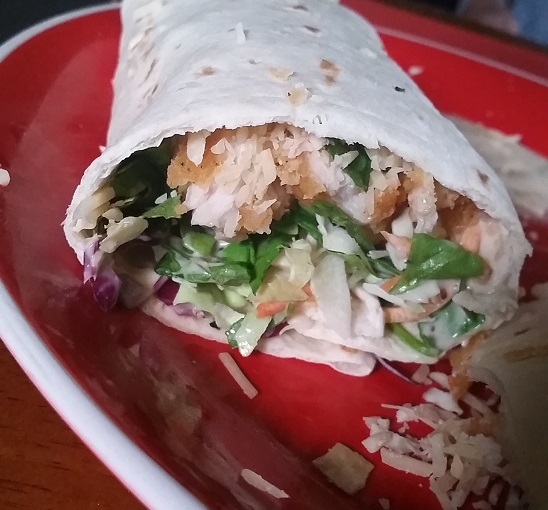 Okay, first of all, when’s the last time you had a wrap let alone considered it for dinner? Probably a while, right? Well wraps are a simple and easy way to give your body a nutritious and protein-packed nighttime meal. 1-2 cups chicken! I used the pre-cooked, pre-breaded kind this time. You can use anything from shredded meat to lunch meat, even leftovers! You really have flexibility here. 2-3 cups greens of choice. This is the good stuff! Pile it on! I used a combination of spinach, lettuce, and cabbage. 1/2 cucumber (or other veggies of choice). Since I was making a Chicken Caesar wrap, I wanted to make it as Caesar-salady as possible, thus cucumbers. 2-3 tbs. dressing of choice: You can use Caesar, or depending on your wrap you could use anything from balsamic to hummus for a great flavor! 1 pinch of parsley. Adds a neat flavor! 2-3 tbs. Parmesan cheese. Okay, you really can’t go wrong with Parmesan cheese. Ever. Assemble your ingredients. I find it’s best to put cheese first, then hot meat on top, then greens, then dressing. Cook for 4-5 minutes in a George Foreman (or oven if you don’t have one, set to 400 degrees). You’ll know it’s done when the outside is darker and slightly warm and crispy. Enjoy with a side of dressing if needed. If you’re in a pinch, if you have no idea what to make, or if you’re on the run, this is a great and easy dinner. Share your unique recipes/adaptations in the comments! Previous Honey Sriracha Chicken – Spicy and Healthy!